40 Spline, Gun Drilled, 6-40 in. For over a decade Spider 9 axles and components have taken racers to an all new level of off-road performance. Our unique approach to engineering and manufacturing has repeatedly pushed our racers to 1st place championships, and we strive to push the industry each and every day. 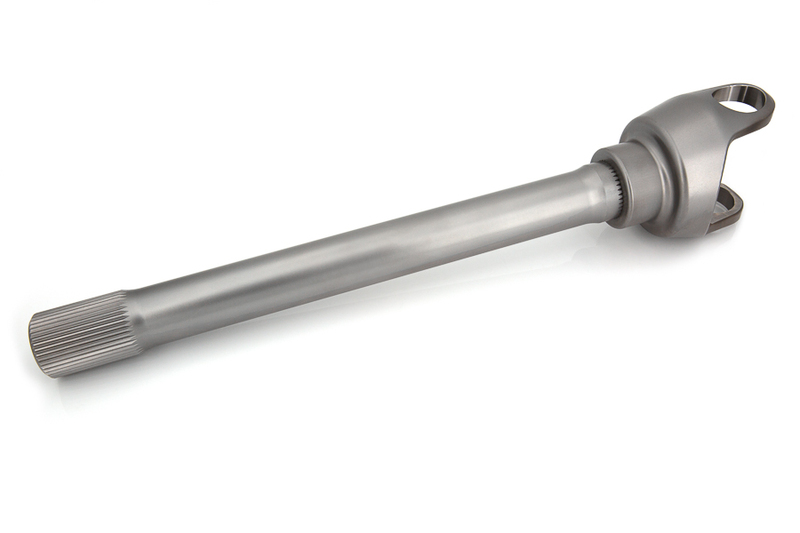 With that, we are proud to release the Pro Series 40 Spline Gun Drilled 300M Inner Axle Shafts. We've designed these shafts with one goal in mind: to keep you on the podium. 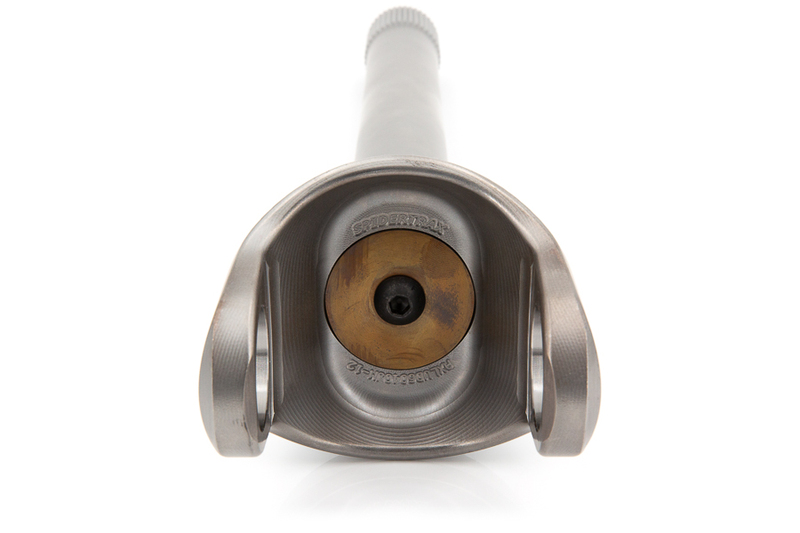 Integrated in our unique webbed designed yoke is an axle shaft capable of 50 degrees of steering, the industry's tightest steering angle for a 1480 60 style u-joint. 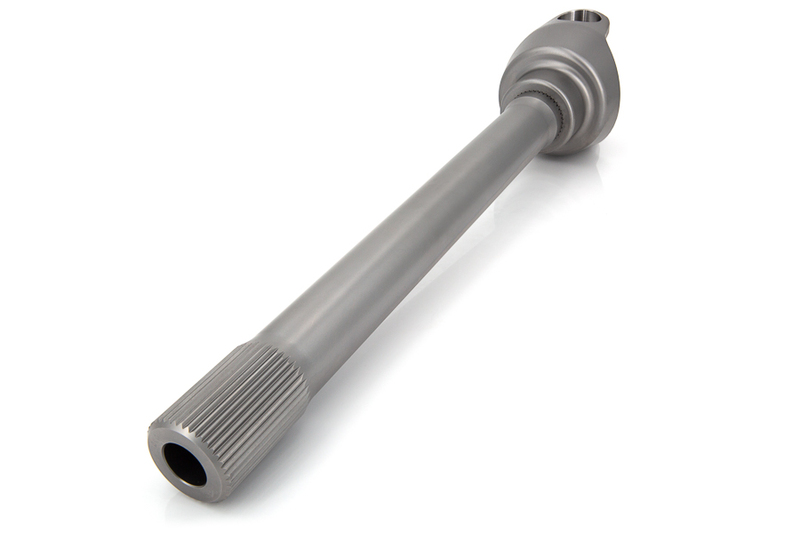 Both axle shaft -AND- yoke are constructed out of billet domestic 300M military grade steel, while receiving AMS2759 aerospace level heat treatment. Now with its 7/8" thru hole, end to end, this axle shaft boasts the best-in-class strength to weight ratio, critical for keeping your rig both light and strong. When you see the Spidertrax Pro Series tag, know that you are getting the best of the best in terms of materials and workmanship. Axle shafts are sold individually (single). Lead-times vary, for an accurate ship date prior to ordering please call or email. Because axle shafts are custom made, payment is taken in full at time of order and orders are non-refundable. We don’t use the term “Aerospace” lightly. Yes, these Pro Series Shafts are manufactured out of the finest domestic military grade 300M on the planet, but there’s much more that makes it Aerospace worthy. We follow the strictest AMS Aerospace standards for our heat treatment, complete with double tempering, snap tempering, and cryogenic treatment procedures. Parts are sampled to ensure proper grain structure is achieved up to 0.0003” from the surface, that’s a depth 1/10 the thickness of a human hair! In summary, you’re getting the best material and the best heat treatment on the market. This may sound a bit obvious, but these Pro Series Shafts are 40 splined. It’s a size that makes perfect sense, especially when running Pro Series 300M Stub Shafts. Deconstructed a bit, you'll find a number of benefits with this increased spline count. Larger spline offers more flexibility in fine tuning the shaft diameter, so that a perfect balance of shaft torsion is matched with the strength of the u-joint and stub shaft. It's not just big, it's sized right. In addition, the 300M yoke is redesigned with larger shaft engagement both in length & diameter, as well as a larger yoke OD for increased strength at high steer angles. Spidertrax Pro Series Shafts are manufactured with the finest military grade 300M material, and in our effort of controlling the accuracy of materials we work only with billet stock. Forgings have their place; in the off-road shaft market forgings are used to drive down manufacturing cost. 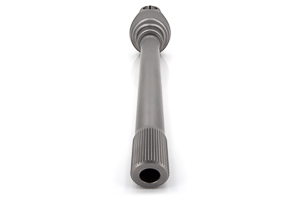 Unfortunately this lower cost tends to create lower quality, with issues of material defects and inconsistency becoming commonplace in aftermarket axle shaft forgings. Whether it's our 1-piece Pro Series Stub or these 2-piece Pro Series Shafts, every part is manufactured out of domestic grade billet material. We pride ourselves on holding the tightest manufacturing tolerances in the business. We take our in-house manufacturing and engineering very seriously and never cut corners for the sake of saving a few dollars. These Pro Series Shafts are no exception to this rule. Shafts are manufactured, heat treated, and then returned to the manufacturing table prior to final assembly to ensure those high tolerance dimensions are perfect. After heat treatment, we bore the holes for the u-joint caps in one single operation, and in that same setup fly cut the insides of both ears to ensure proper u-joint spacing.